In this article you will learn how to solve this problem in two different ways. The most probable cause is that the iPod / iPad lacks codecs support in which movie file was encoded. Another possibility is that the resolution of the video is too high for your device to handle. Whatever the reason, the solution is to convert the video files to the appropriate format. There are two ways to accomplish this and we are going to examine both of them. First, we will show how to solve this issue by installing third-party converter software and then, how to convert video files directly from iTunes. This iTunes alternative for Mac auto converts any non-Apple video format like MKV, AVI, FLV, etc to MP4 when transferring videos from Mac to iPhone iPad. You don’t need to convert video format before synchronization. Better yet, it reduces 50% of video size with no quality loss and auto rotate video. Connect iPhone/iPad and Mac with cable. Select videos in whatever format on your Mac. Hit Sync button to transfer videos. Format conversion will be done simultaneously. First lets briefly examine free third-party converter software available to download. Even if the software says it is free, some of them will give you limitations while converting either by adding annoying watermark, slower conversion, or limited video length. Until recently I was using Free MP4 Video Converter, but with the current version available (november 2017), the software is not that good anymore as it doesn't give you much options on how to convert the movie. I have tried several free alternatives and at the moment, the one I liked is HandBrake, which is the open source video transcoder available for Windows, Mac and Linux. First you convert the movie file using that tool. Then add that file to the iTunes library. Finally you have to Sync the library to your Device, just make sure that under Movie tab you have selected appropriate checkboxes so the video files will also be synced. Here is a quick guide on how to use the HandBrake software. First you need to choose a source selection, either a folder (for multiple files) or a single file. Select a destination path, where the encoded files will be stored. Next, on the right sidebar, choose the device. The iPod and iPad are under Legacy group. Finally, click on "Start Encode" button located at the top. Under Picture tab, set the Width to 640. The dimension will automatically be set to 640x480. Under Video tab, set the "Encoder Profile" to Baseline. Also under Video tab, set the "Encoder Level" to 1.3. Note: One advantage to use iTunes for converting the video files is that it will give you the most optimum result automatically. 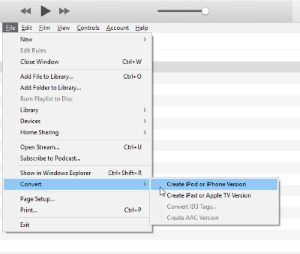 Converting video directly from iTunes is very similar to the 3 steps mentioned earlier. First step is to add the video to the iTunes library. Make sure, you have Films group selected, before adding the video file or folder to the library. After the file is added to the iTunes library, find it and select it. Then go to the menu bar and select File > Convert and choose either "Create iPod or iPhone Version" or "Create iPad or AppleTV Version" depending on the device you are having. After conversion has ended, you will have both video files in iTunes library. Select the original video and remove it from the list. If you cannot tell which one is the old original file, add a Date Added Column by right-clicking on header row (where you have Name, Time, Genre, Rating,...) and select Date Added. Now all that is left is to Sync your iPod / iPad. Note: If the video has not been added after the syncing, verify that the checkbox near the movie name in the iTunes library is checked. When converting the video files to iPod or iPad devices, you might get an error message saying that video file cannot be added because it cannot be played on that device. This happens when either the codecs or resolution of video files is not supported by the apple device. We have examined two ways to fix this issue. We can use third-party video converter software or we can convert the movies directly from the iTunes software. I hope you have found this article useful. If you prefer some other third-party converter tool, drop a comment and tell us about it. Thanks for this. I have had this problem for years and using the itunes converter worked perfectly. First website i've ever seen that actually offered a working solution. Thanks. I'm glad you found the article useful. What version of iTunes was used for this article? I have 10.7 and "Create New Version" does not appear on the File menu. I was using latest version of iTunes at that time, which according to Wikipedia was 11.0.1. Option "Create New Version" is under File in Menu Bar, so from options you see right now select "Show Menu Bar". Menu Bar will appear.There you should find “Create New Version" under "File". Thanks a lot! This was very useful! I followed the steps accordingly but it only lets me create AAC version. the other 2 options are grayed out. I have a new Nano 7th Gen, iTunes ver 11.1.2.32. I am unable to copy mp4 or m4v videos to Library. I've converted the file with AnyVideoConverter. All attempts result in the error "fileName was not copied to the iPod..."
Part of the problem may be the fact that this Nano is my first purchase from Apple. You need to set the correct codecs and resolution for your device in order for video file to work. According to http://support.apple.com/kb/sp656 for iPod Nano 7th Gen. you need to set codecs to H.264 or MPEG-4 and resolution of the video file to 720 x 576 pixels. I recreated the mp4 file using the suggestions, but the file still would not transfer to the Library. I failed to mention I'm using a Windows Vista pc that contains the mp4 file. Does this make a difference? I don't think the problem is Windows Vista. Have you tried the suggestions in the article? By using either " Free MP4 Video Converter" or iTunes? Problem resolved. I needed to install QuickTime on the pc. Now I can transfer mp4 files to the iTunes Library. 1- download any converter, I have used format factory free tool. i couldn't find the second version of the video after it finished converting...what should i do? How did you convert the video? With iTunes or some third party software? In case anyone else got the issue I had, I had to add the side bar. It seems selecting video by icon did not work as the create iPad option would be greyed out. Adding the side bar (view->show sidebar) did the trick when selecting the item that way. Very weird. Thank you! This was a great solution. Under 'File'/'Create New Version', it is greyed out. I was going to try Genie's suggestion but I do not have a sidebar option under 'View'. Anyone else run across this without downloading a 3rd party converter? Try selecting the video first. I only have options under ‘File/Create New Version’ greyed out if no movie is selected. Try adding the file manually by going to File > Add File to Library in the Menu Bar. Then when video is added to the library, select it. Options in Create New Version should now be available. Thanks for the iTunes conversion solution. I'm glad I found a website that offered the key to the problem. Thank you so much for your help. The iTunes Conversion worked very well for me. Apple should reward you as an iTunes expert. I am trying to convert some itunes to the correct format for my ipod classic. when I choose the convert option in itunes, it is grayed out, even though I have the video selected? any suggestions? Were those movies purchased from the iTunes Store? If so, it is possible that you have a HD version but iTunes expects a SD version instead. I suggest try getting SD version and try again. I found this article explaining how to download SD version of your movies from iTunes Store. You might find it helpful. When i created the new version for iphone, the whole video became green and the quality is bad, any way around this? Unfortunately, I don't use the converter in iTunes at all, so I'm not sure how to fix your issue. This can happen when video has a format that is not playable in iTunes. Converting the video to a proper format should solve the issue. The fastest and easiest way is to use Free MP4 Video Converter mentioned in this post. I use it for all my movies and never had any problem with it, just make sure, you do a custom install as it tries to install other stuff too. 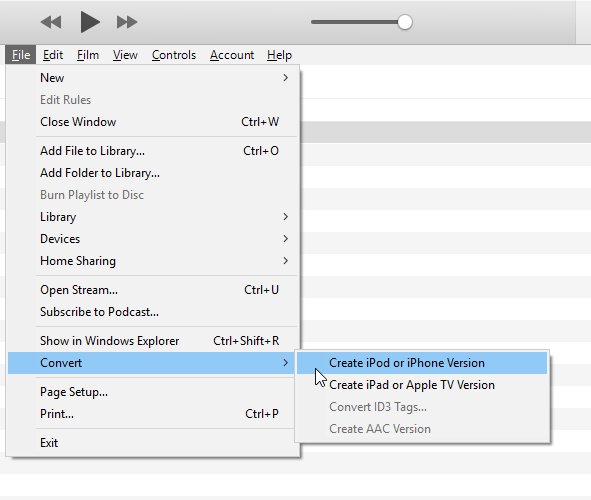 For win 7 users you should have codec and quick time player then only you can import videos from itunes to iphone or ipod. When I read michaelB's comment, it was same as mine. So I downloaded QuickTime version 7.7.6 (as I'm using windows xp sp3) It goes with all the windows with no bugs n installs fine too. coz some new versions like 7.7.9 don't install fine. They shows package error. So after installing QuickTime. No need to keep it opened. Close it. Open ur iTunes(latest). Connect ur iPod (mine is nano 16 GB 7th generation) Make sure now that your video is in mp4 format n none other. 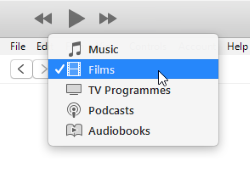 Open the movies window of the iTunes library. Which is usually below the menu panel. They have small symbols for music n movies n TV shows. Once u opened the movies window. Drag any of your favourite mp4 movie (In resolution Not more than 720x576 in case of nano 7th gen) and drag it over the iTunes library. If u can't do drag n drop. In the menu panel there r options that says file, edit, view, help n such. Go to file>add file to library>select ur file>click OK. Done. Now, when I did that my movie file still didn't appear in the movies library even after installing QuickTime so what I did was. I went to the many panel option again. File>library>organise library>consolidate files to ur iTunes library(check it)>OK . Now u will see your movie file is getting copied to the library from your PC. Voila. Now that its in your library u can drag it to your iPod's video folder. And enjoy the movie on your iPod. I have not tried converting the movie yet because my movies's specs were Lower than required for iPod. But I'll use the iTunes conversion if that case happens. Thank You so much! Everything works great now! What a relief! So helpful, thank you!! only slight difference is that in the current iTunes version, you go to File > Convert > Create iPod or iPhone Version or File > Convert > Create iPad or AppleTV Version. I can't do the very first step, adding files to the library. They do not appear in my library. What should I do? Thank you soooooooooooooooooooo much. This really helped me. So I downloaded the third-party converter you (author) use. However, when I add the video file and "convert" it to any file it cannot convert. It says "Conversion error". How do I properly convert the video file and to which format do you/I convert it to? I have noticed the current version of "Free MP4 Video Converter" doesn't give you options to select ipod / iphone / ipad devices. I have now updated the article in which I recommend "HandBrake" video converter instead. Try to convert the video with this software and let me know if you still have problems. HI. The article is several years old and still works! Thanks! My two cents: I use youtubedownloader and have been using it for years. There are two versions--free and pro. Those guys are great. In my current subscription, I emailed them to ask for a link for their 50% offer as I was broke, and they gave it to me for way less than 50%. That's why I keep going back to them. Just follow the instructions and boom. you are done. Worked perfectly fine for me.